A few weeks back I mentioned a profitable new route I went on. It hasn’t been nearly as good since, but on that first day I happened upon three quality piles within the first four streets. This one, which sat in front of a stately yet decrepit house was the last of the bunch. 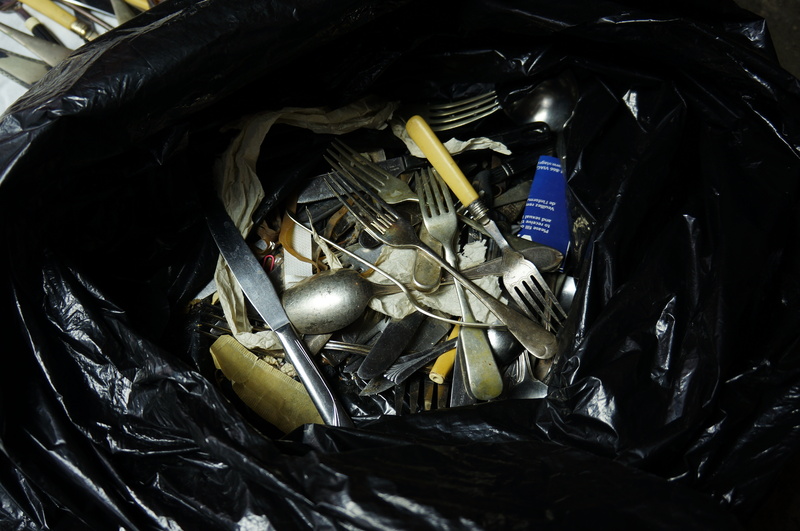 Inside one of the bags was a large collection of silverware. 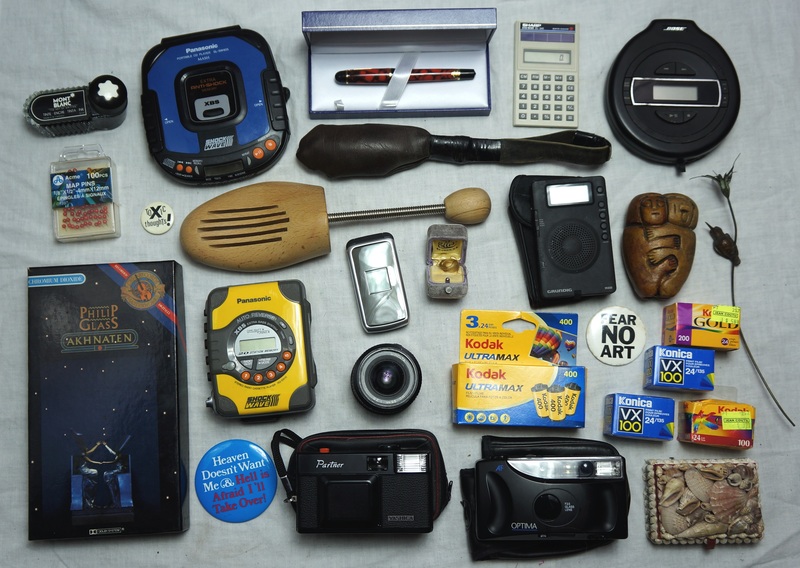 I took a completionist approach to cataloguing this stuff – I took pictures of everything! That might have been a little over the top, so bear with me here. I’d say that between 1/4 and 1/3 was junk, or too worn out to be sold. However, a good percentage of this haul was quality, and several pieces were very nice. Most of the silverware in the next few photos are yard sale quality or junk, though a few 800 (80%) silver pieces are mixed in as well. 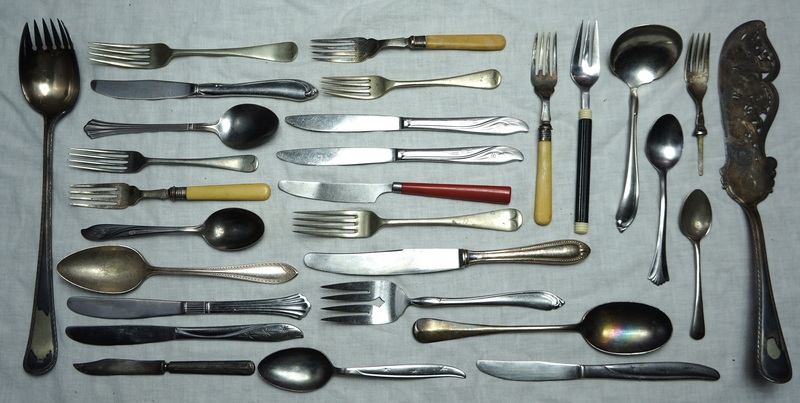 That three pronged fork at the bottom left is silver, for example. Most of the pieces on the right and left are too worn out to be sold – I left them on the curb for someone else to pick through. The dinner knives are nice, if not particularly valuable. Nothing too special here, though if I remember right the knife third from the top on the right had a 80% silver handle. 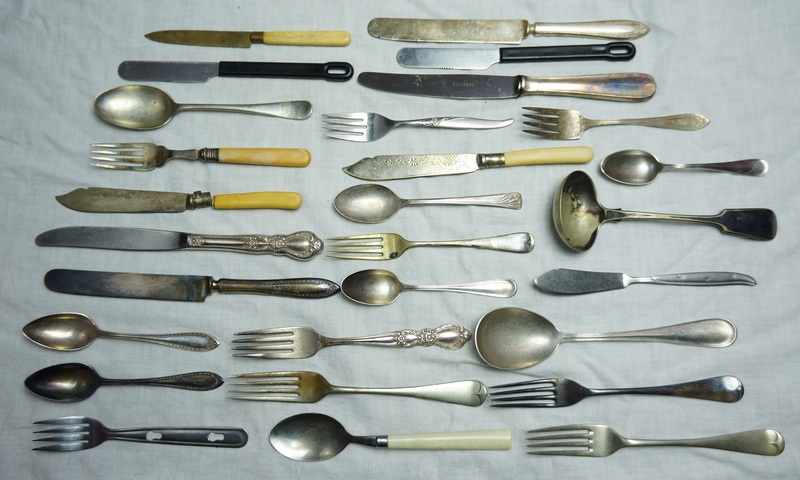 A few of the four pronged forks might be of the silver variety, though I can’t remember which ones exactly. Here we have two more of those three pronged silver forks, and maybe one four pronged one. Two more three pronged silver forks here. Below is mostly junk / yard sale stuff. Finally we get to the best of the bunch! 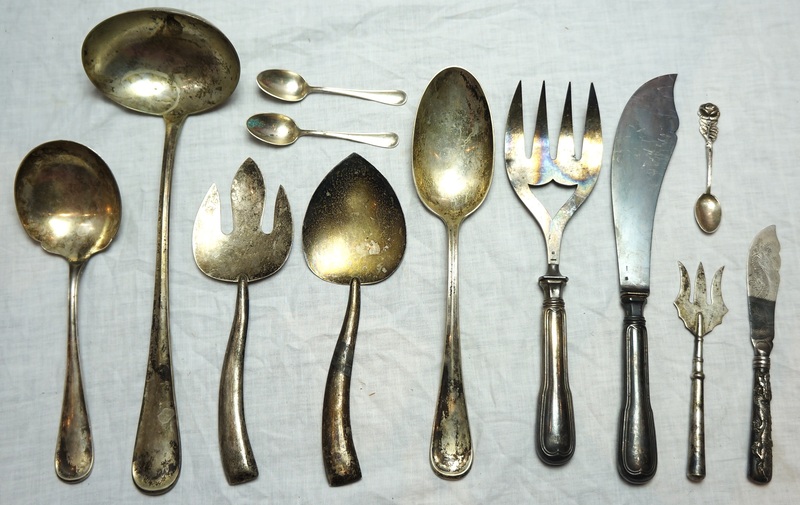 The spoon and ladle on the left are marked 800 silver – I believe they were made in Germany. The little spoons and larger spoon bear similar markings. 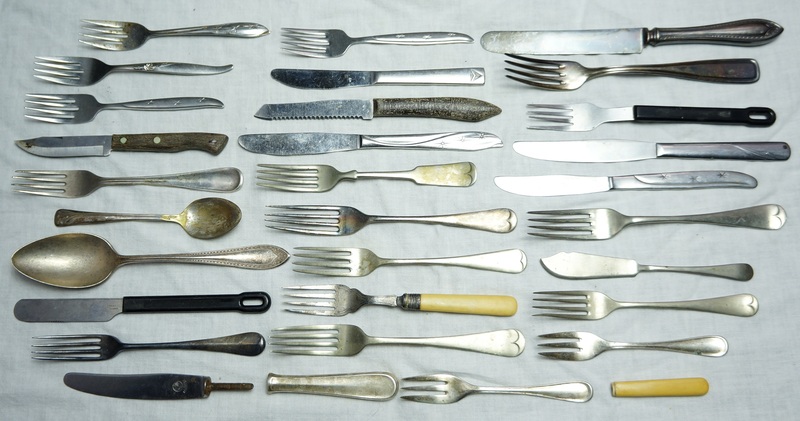 The big serving knife & fork on the right were made by Christofle, a pretty well-known and respected company. They’re probably only silver plated, but they should sell for a decent price regardless. 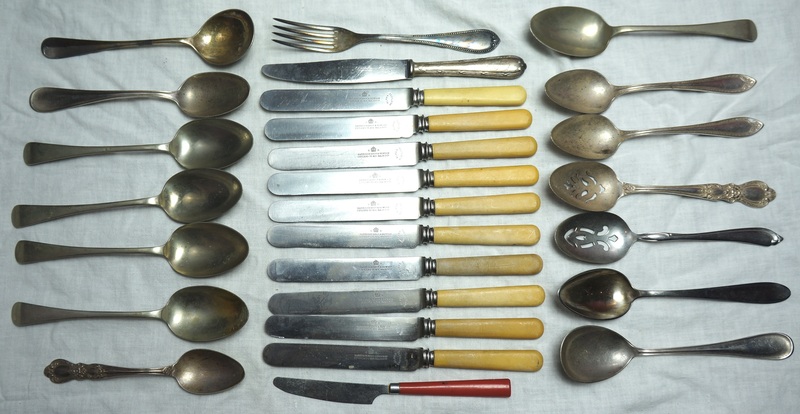 Those curvy pieces on the middle left (salad servers perhaps) are signed Sanborn sterling. They have a mid-century look to them, and I think they’d sell for around 150$ cleaned up. These were the most unusual pieces of the bunch. They seemed to go together, though it’s possible they’re totally unrelated. The fork is certainly more plainly designed, and features some character stamps on the back that I expect are Chinese. Zoom in for a better look! The knife is much more ornate, with detailed dragon motifs on both the handle and blade. It also has a stamp on the back, but I can’t really make out what it says (maybe IJC?). I expect both are made from a high grade of silver. If anyone knows where they might have come from, please let me know! Overall, the silver in this collection (both 80%, 92.5%, and suspected but unknown) weighs around 1.6kg, good for somewhere around 700-800$ in scrap value. However, several of the pieces are worth selling on their own merit (like the big ladle) and should go for a fair bit more than that. In short, this silverware haul should end up being a very good find! I’ve been having very good luck finding silver in the last six months; here’s hoping the trend continues. Here’s the second pile. Unfortunately, before I could finish looking through the bags a grumpy older lady walked down the street and started bothering me. She told me to put all my finds back in the bags, a laughable instruction that I never take seriously (unless it looks like someone might actually fight me over it). When people interrupt me mid-pick I’ll often use harmless looking props as examples of what I’m looking for. In this situation I asked this lady why she’d want me to doom this perfectly nice carpet by putting it back in the bags. She was unswayed, but I saved it regardless. I later noticed that it smelled a bit like cat pee, but not very strongly so maybe one of those sprays can remove the stench (I’ve had success using those in the past). As for the carpet itself, does anyone know who might have made it? The colors are great, and it might be hand-woven. That Waterman fountain pen was another prop. It was basically brand new, and there was no good reason for it to be trash. Again, she didn’t care but I kept it anyways. The pen is part of the Phileas series, and in this condition it should sell for around 100-120$. Not bad! That Bose CD player would have been nice but the battery terminal was ruined by corrosion. That can be fixed, but it wasn’t in particularly good condition otherwise. To the e-waste bin it went. The expired film and disposable camera made me about 8$ at the vintage market. That leather thing was filled with pennies, probably a makeshift weapon of some kind (like the classic “sock full of pennies”). That ring box was cute; it contained a curl of hair, but I used it for shipping out a ring I sold recently. The cameras weren’t anything special but they should sell at a yard sale. These folks seemed to have a sense of humor, perhaps best exemplified by the novelty eraser and “Luv Ewe Party Sheep” in this photo. 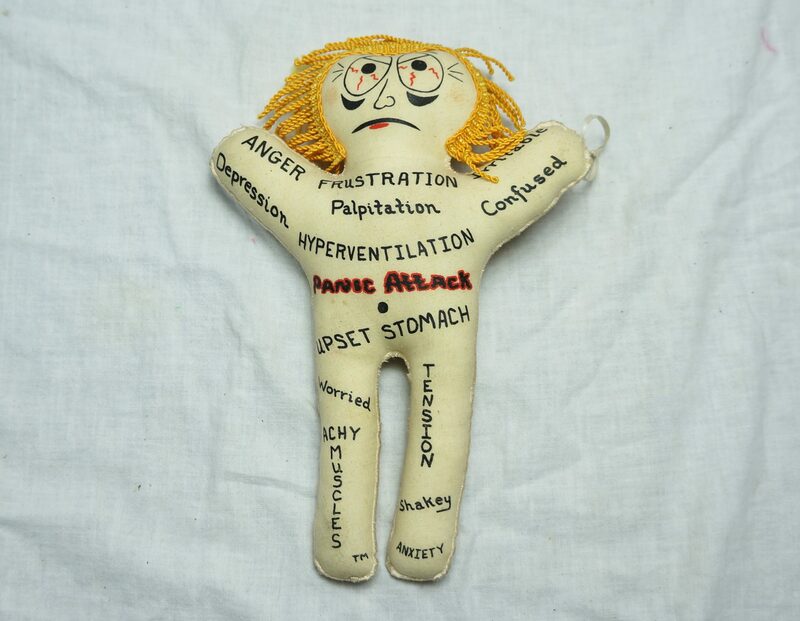 Also this voodoo doll, which sold at my most recent vintage market. Perhaps that lady would have left me alone if she had upset stomach! Unfortunately, I had no pins on me. I wasn’t able to search two of the five bags – hopefully I didn’t miss much. I’d be peeved if those bags ended up containing the Montblanc pens and gold bars. You never know. I haven’t seen anything from these spots since that first fateful run. The first stop, however produced more in subsequent weeks. I’ll show you some of those finds in an upcoming post! 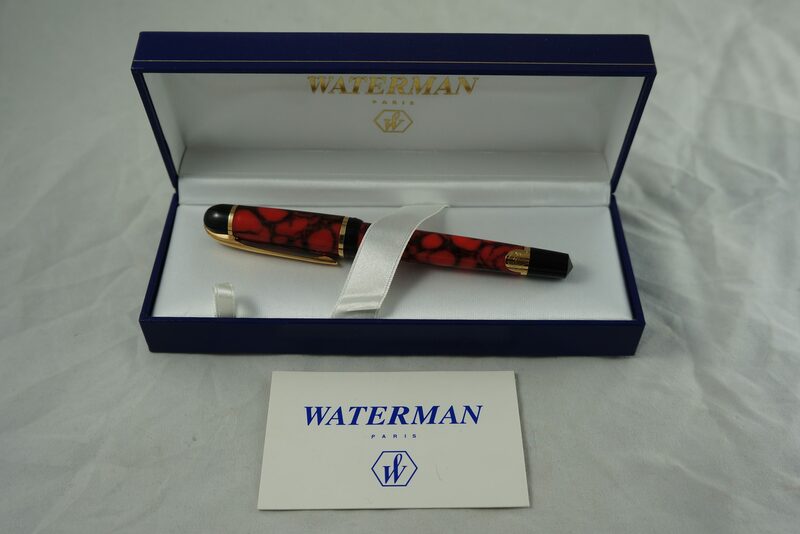 That’s a nice Waterman, still in the box. You just wonder about why someone would throw it away, right? re the smell in the rug, (or anywhere else)….Maybe put it on a large garbage bag to contain mess…Put down a good sprinkling of baking soda, lay down rug, cover well with baking soda. Leave to sit for some time…as long as you have patience. Shake thoroughly, clear baking soda. Repeat. Repeat until smell is gone. Then vacuum thoroughly. Will take some work to vacuum out baking soda, but baking soda is very good at soaking out smells and stains. The Sanborn sterling salad servers are probably vintage Mexican silver. They should do well enough on eBay. A lot of vintage Mexican sterling serving pieces have wooden handles, but these are unusual and very nice. Look for a crown and crescent moon on the 800 silver, as those are the most common German marks for vintage silver. The ornate Asian pieces may be Chinese export silver, but you’ll have to do a bunch of research. Nice haul!! The Sanborn pieces are indeed Mexican silver. They have a sort of mid-century look to them, and I think they’ll do quite well on eBay. The German silver does have those sorts of marks (I’ve been finding a fair bit of German stuff recently, as you’ll find out soon enough!). Love the carpet the best – its beautiful! I’d take a spray hose to it myself and let it lay out in the sun for a few days. Cat pee – ugh. I always wonder why people have such a problem with anyone taking trash at the curb. Isn’t it better that someone would re-use that stuff instead of tossing it in a landfill? Who knows. It’s not like I was taking their old tax papers or old ID cards or anything. I think some people just have nothing better to do, or are just paranoid to the point where they lose their common sense. Thanks for posting so often! It’s not the stuff so much as how you write about the stuff. You really are a fantastic writer! Glad you think so! Sometimes I wonder how many people read my posts (as opposed to just looking at the pictures) so it’s nice to know that someone does! 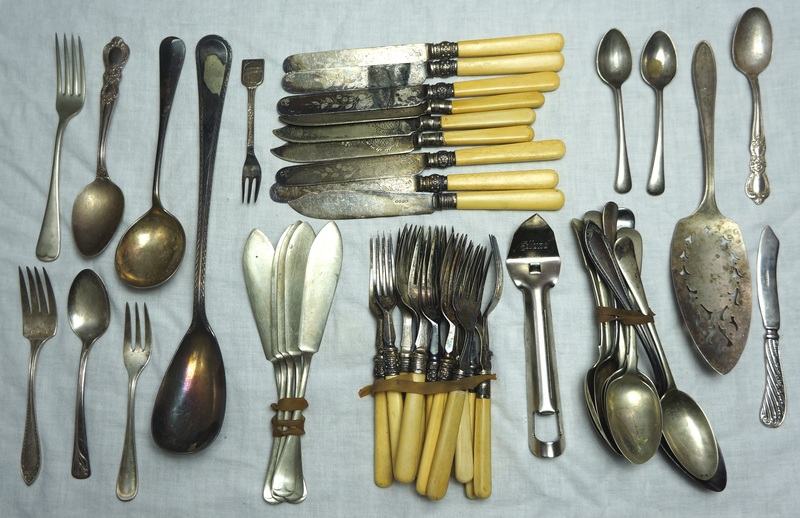 Arranging all that cutlery for photos must have taken some time (hope you had an extra pair of hands for that). Re: Akhnaten and Einstein on the Beach … are those VHS tapes? Nope, all me ha ha. Would have been nice to have an intern do it! Those are cassette tapes. However I do know that this style of fork is popular during the Art Nouveau era. Thanks for the info! What’s the price on the fork, if there is one? I have more research to do, that’s for sure. I enjoy and share your rummaging for treasures. Here in Nashville, TN I used to wander around around Vanderbilt when the dorms closed. I also find good lures touring around the lakes in my kayak! AndI live block from a pallet factory which lets me have wood. 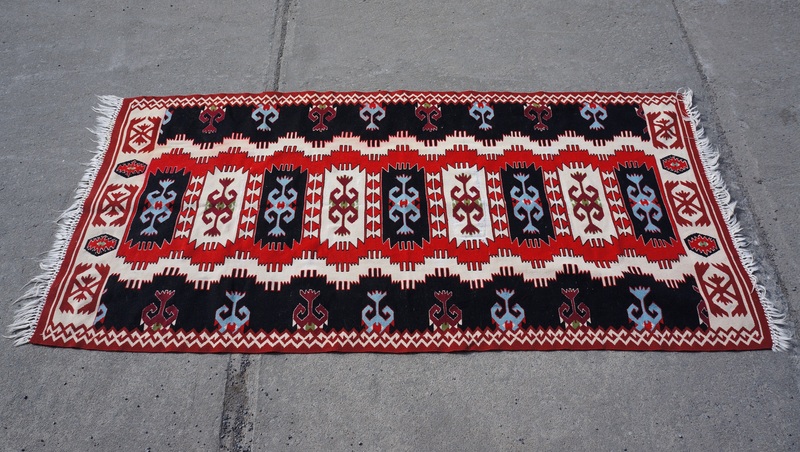 I have two rugs very similar to those….my mother-in-law purchased in Morocco in the early 1960s…..she also purchased a 9×12 which went to her daughter….something was spilled on it and she threw it away!!! I almost fainted….great post as usual. I cannot believe some old bag got in your face over the garbage! Great score with the cutlery! Thanks for saving this stuff, Martin. Especially the e-waste! That cranky woman should be ashamed of herself for tossing perfectly useful items away. If you ever feel crafty you could make some Spoon Rings out of the “cheaper” handles that you found. So many cool things can be made from old silverware, jewelry to mobiles. They’re long gone by now unfortunately. Maybe an archaeologist will find out what was inside when they eventually dig up our dumps. Don’t use water to wash the rug until you test it for colorfastness! The Bakelite looking silverware is very popular and hopefully will make a lot of money for you. True, some of the older rugs are dyed with vegetables if I remember right which can’t be cleaned as easily. 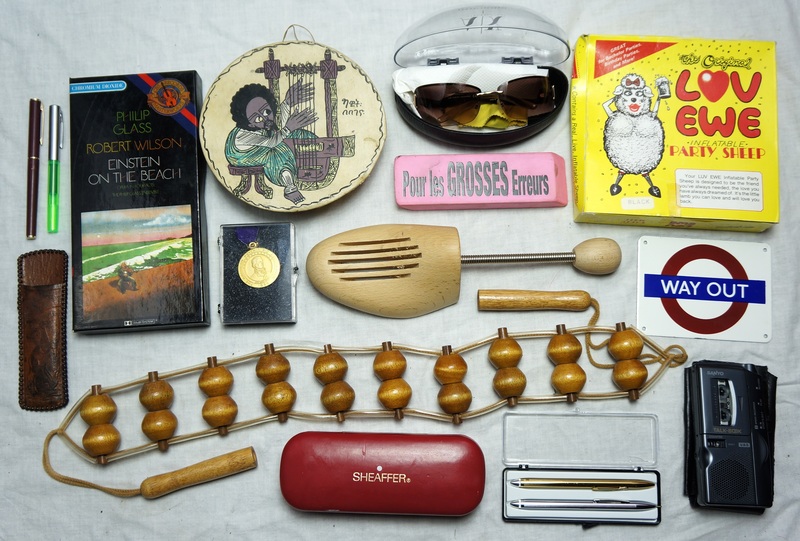 I don’t think any of them are bakelite, the yellowish ones are probably French ivory. Check those handles on the knives. They may be plastic or could be Bakelite. Very desirable! 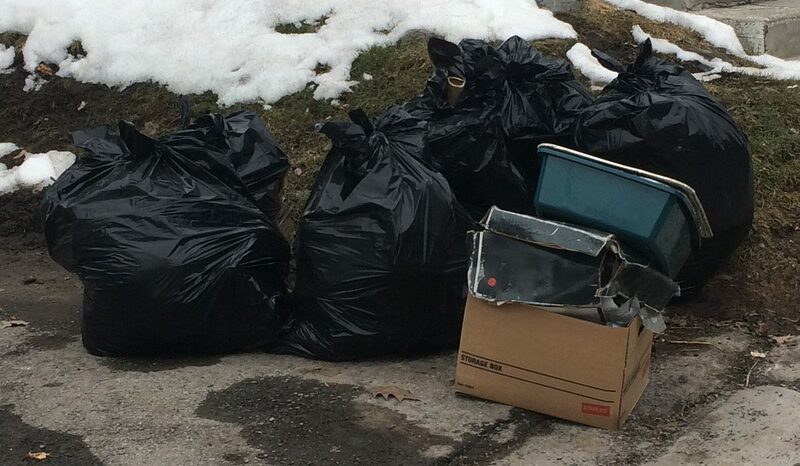 I kind of understand people not being very fond of others going through their garbage… I sell, donate, repurpose, recycle and put on the curb as much as I can to keep the dumpster material to a minimum. But when I put something in the garbage it is kind of meant to be there and stay there in my best interest and other people’s – like cat litter, band aids, old bills with personal info, photos or papers documenting relationships that went awry, barfed on rugs or whatever. What would be really nice was that people used much more discretion with the stuff they just throw away. And it would be so easy to do so. Even the most uninspiring stuff doesn’t last more than a few minutes on the curb and I live in an affluent neighbourhood! Anyway, I love reading your blog and hope you find as much interesting and valuable stuff people mindlessly toss away. Yes, at the garbage dump there’s no connection to the person who threw it out. But waiting for the truck, it’s obvious who threw it out. It can be embarrassing, even just the fact that you threw it out rather than dispose of it properly. I can’t remember if it was a joke, but my mother told a story once about a friend of hers who put liquor bottles in the neighbor’s recycling bin, not wanting people to see how much she drank. People going through your garbage can feel like someone is studying you under a microscope. That’s apart from the people who don’t want anyone to benefit from their garbage. I’ve said it before, but it seems like years ago it was easier to see what people threw out. I can remember seeing a lot more spread out for all to see. 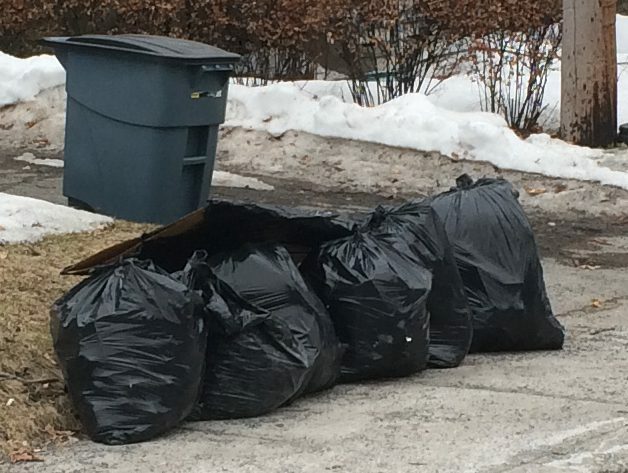 So maybe that meant garbage bags were for real garbage. They changed the law in Montreal in 1999, you had to use actual garbage bags (rather than plastic shopping bags from the store) and everything was supposed to go in bags. And after that, there seemed to be less visible. So less of the “take a look, take what you want”. Maybe I’m imagining it, but maybe not. Yes it’s true, there are good reasons one might throw stuff out and not want people to go through it. Unfortunately there’s no way of knowing for sure why something was thrown out, or how the tossers would react to seeing someone pick through it. I think about it a lot, because I’m sure it causes some folks emotional pain to see someone looking through their trash, but many people also don’t mind or are just plain wasteful, and scavenging is definitely beneficial to the environment and the long-term health of the planet. Overall I think the benefits far exceed the costs. Was it even her trash or was she just being a busybody? If it’s the latter, I would have simply ignored her and gone through all the bags. It’s legal as long as it’s on the curb. Great finds regardless! I think she was a neighbour. I considered doing that, but it was a little awkward. Maybe I’ll be more assertive in the future. Next time just put the rest of the bags in your car to go through later (or around the corner) and leave. It’s not like you’re ever going to see that busybody again…who cares what she thinks really?? If the clear green fountain pen is a Sheaffer, it is probably what is called a school pen. In good condition they sell for between $5 and $10 on ebay. Not sure what the make of black one next to it might be. However, I have a A&W one that looks similar and writes like a dream. A&W is a German brand which was sold at discount stores but are well liked by everyday fountain users. Saw on listed on ebay recently for $24 — It was the Marquis model which is black plastic with gold plated trim and a gold plated nib. It is a Sheaffer. It seems to be in good condition, I’ll sell it at a yard sale. I’m not sure the make of the other one but I think that it’s a Sheaffer as well. It has some scratches to the paint, but is sturdier than the student pen. Hi Martin, love your blog and have read it for a long time. I just had to respond to this post because I have the exact same Waterman pen! I’ve bought it new in the shop, I think it was around 20 years ago, as a student. Still use it a lot, it’s a great pen. Keep doing what you do, it’s awesome.